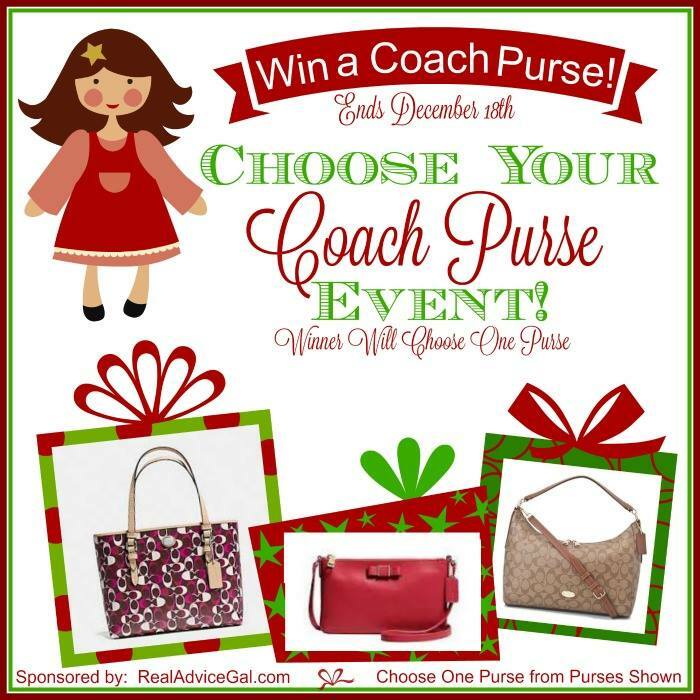 We know how much you love Coach handbags, another blog friend is doing this great giveaway! If you win, you get to pick the one you like best from the THREE great choices. It’s gift giving season and together with my blogger friends, we have teamed up to give you an awesome giveaway event. We have three gorgeous purses on hand and in this giveaway we’re giving ONE winner a chance to choose one Coach purse. So which is your favorite among the three styles? Giveaway is open to US only and runs from 12/4/15 – 12/18/15 11:59pm EST. My top choice has to be the one on the far left…the multi color, print, and size is just right for me! I love the 3rd one, all the way to the right. I like the middle(red) one. I would love to have the tan one. I have wanted a coach purse. Thank you for the entry. I like the classic style of the one on the right, that one would be my first pick. I like the red one. I need a smaller purse for quick trips and going out. I really like the first one…fun colors! I love the older style bucket purse but dont care for totes. The tan. Classic coach is the one for me. I would choose the first purse in the picture. Looks big for my needs. I really like the middle red one. I have been entering Coach giveaways for a long time with no luck! Maybe this time! haha God bless and Happy Holidays everyone! I think gift baskets, especially homemade ones are the best gifts as they can be personalized. I would choose the first one-that is on the left. I like the first one in the Picture. I would pick the furthest one to the left of the picture. I would like the tan one! I love the first one. I love the color it has in it. I would love the 1st one, beautiful! The middle one is my favorite because it looks classic and timeless! I like the 2nd one? I would like to win the tan one, I feel like it would match more outfits. I would like the one in the middle. I like the tan colored purse looks really great! I’d pick the one on the right but they are all so cute. They are all lovely but I would choose the red purse. My favorite one is the purple but I would be grateful for any thank you for the chance! I’d pick the first one, the pink signature tote. Love the tote, but the hobo is great too. Oh I would love all 3, but I would choose the pinkish one on the left. I love them all but if I have to choose I would take the one on the right side,thanks for the chance to win such a beautiful purse. I commented on Purely Simple and I’m commenting here. I’ll have to look for these mixes at Giant this week. So hard to choose because I love all three but I think the first one on the left is my favorite.